The stories about Jack Micheline are legion and they range all the way from fact to tall tale and anecdote. Jack Micheline was arrested on this corner, Jack Micheline was staggering drunk down that side of the street, Jack Micheline wrote a poem and gave it to Bob Kaufman right in front of that coffee house over there. Jack Micheline was everyman and Jack Micheline was no one. 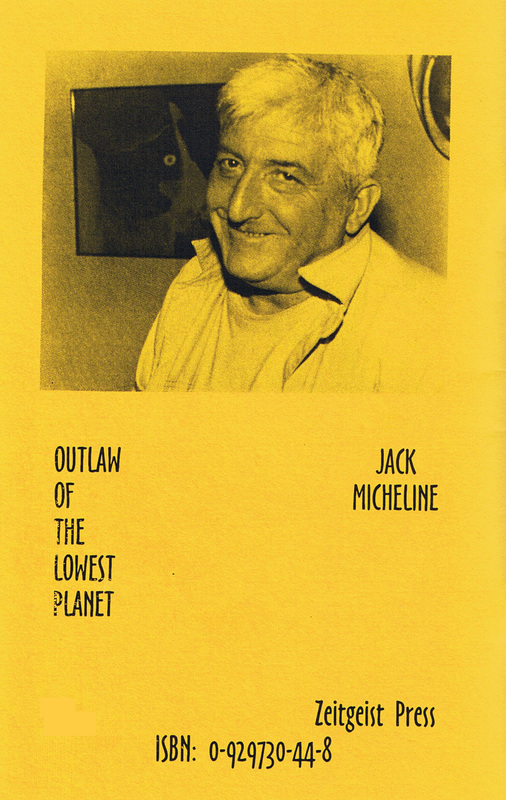 Jack Micheline was always on the hustle for a poem but Jack Micheline was incapable or simply refused to hustle himself to the mainstream publishers the way that Allen Ginsberg, Jack Kerouac, or William S. Burroughs did. That’s very possibly one of the reasons that Micheline’s work appeared in the small press for most of his life. That’s probably why his work remains uncollected in book form to this day, long after his death. Which is unfortunate simply because Jack Micheline was a major poet writing for limited print runs. Sounds familiar, doesn’t it? If Kell Robertson is the poet of the american west, the high deserts and the mountains, then Jack Micheline is a street poet, the poet of the diners, the bus depots, the cash registers, the billboards, the urban set of railroad tracks, the names of the avenues. When you read Micheline you get the close to the pavement feel of the city, the despair of big city living, the skyscraper celebration, along with the stink of the cheap hotels and rooming houses. In this respect, he and Bukowski knew what it was like to just barely survive in the city. The major difference between Micheline and Bukowski is that a Micheline poem is mostly a lyrical celebration of the city while the best Bukowski poems concentrate on the down and out particulars, hookers, a pile of dogshit on the sidewalk, a grueling hangover. Bukowski dealt mainly with the stink of the human condition. Micheline often transcended that and celebrated the fundamental connectedness of people. What is interesting about Micheline and Bukowski is the trajectory that their lives took. 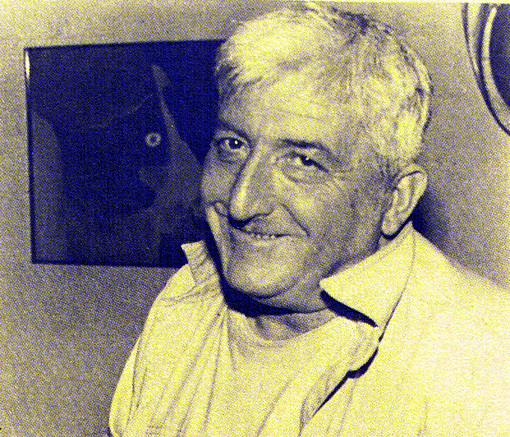 John Martin, the creator of Black Sparrow Press, discovered Bukowski and the rest became history. Micheline was discovered by many small press publishers, but none with the luck and the savvy of a John Martin. And, luck may just be the key word. I suppose the question that needs to be asked is why did Bukowski become so hugely famous and successful while Micheline, at his death in 1968, had never attained the same kind of renown? Both poets were legendary for their drinking and brawling. Both were known as social outlaws, both could be difficult and unpredictable and even dangerous people to know. Still, it is ironic that the behavior that made Bukowski famous to the point of becoming a celebrity literally marginalized Micheline and relegated him to neglect by the time that he died. This doesn’t mean that he didn’t have a loyal following of readers. 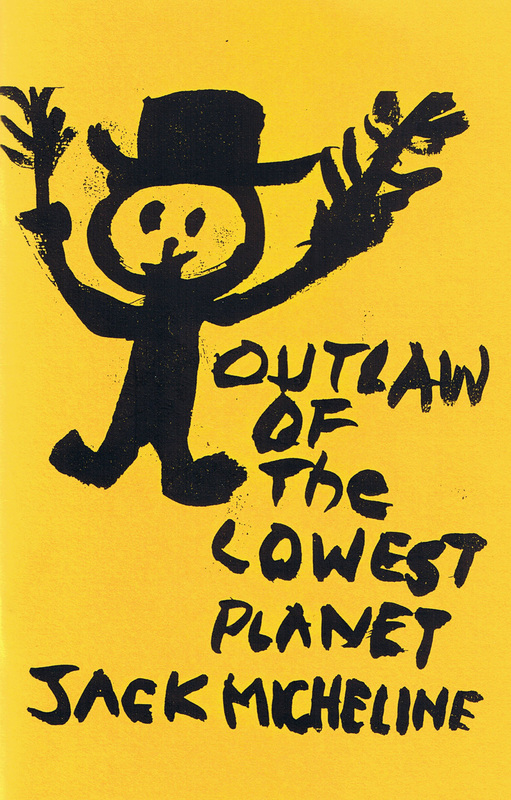 However, it does mean that most of his work appeared in short run zeroxed editions while Bukowski’s work was being published in languages all over the world. Where poets are concerned, the question of fame is a devouring demon. Devouring and totally random in the way that it deals with poets. And, while Micheline may have worked hard to avoid fame or success, he had to be painfully aware that poets he knew and knew well had become famous all around him. The whole question of fame with regard to Micheline really doesn’t matter now except to a future biographer and I have no doubt in my mind that someone will eventually write the story of his life. It’s just simply one of those books which needs to be written. What is important, right now, at this moment, is to acknowledge in print that Micheline was every bit as good a poet as Ginsberg or Kerouac or Corso. They were his immediate contemporaries. Bukowski was an entirely different matter because he was never associated with the Beat poets in any important way and because he was a kind of poetic movement unto himself. No one could do what he did. 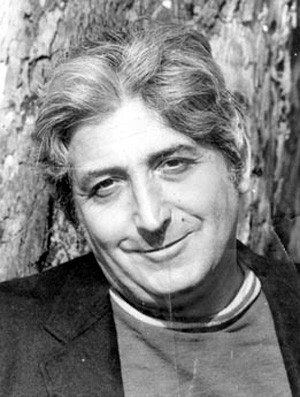 While Micheline never wrote a poem as important and emblematic as HOWL, never wrote a novel as iconic as ON THE ROAD or as experimental and outrageous as NAKED LUNCH, he did leave a body of work as lyrical as one poet’s of that time. 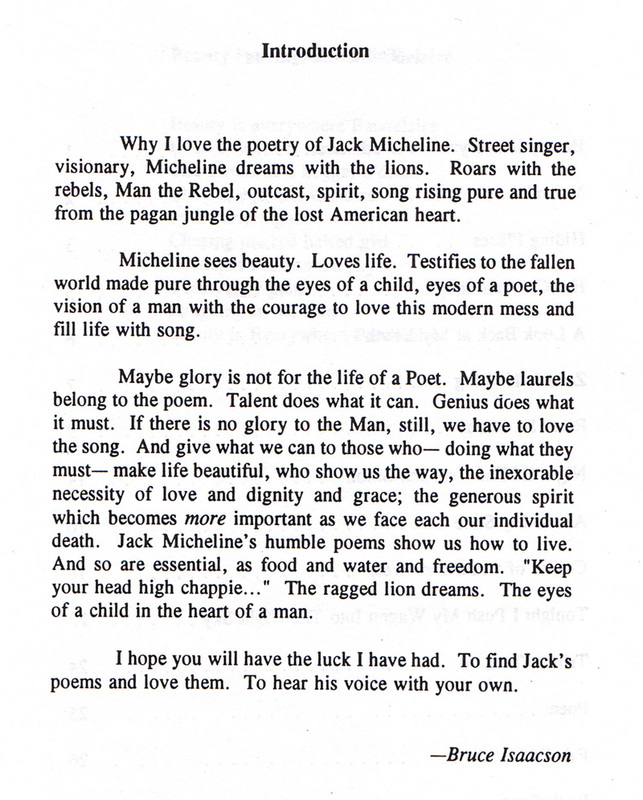 A full discussion of Jack Micheline’s poetry is worthy of not one but many critical studies. However, here, all I really need to do is call attention to one remarkable poem that Micheline wrote on a bus en route from San Francisco to Santa Rosa on March 15, 1982. Chasing Jack Kerouac’s Shadow is in my opinion one of a handful of great lyric poems written in the closing years of the twentieth century. The long lines situate it directly in the Whitmanic tradition, yet the voice of the poem, the sound of the poem are strictly Micheline’s very private sound. In this poem, you can feel Micheline’s motion on that bus, the experience of being jostled, of actual movement. 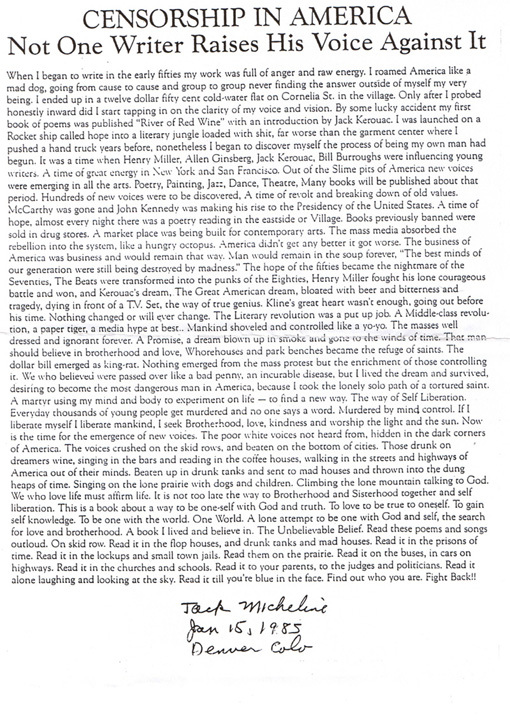 “…streets, poems, nuthouses, jails, paintings, con men and time….” You are there sitting right to Micheline and he is telling you the lines the second that he writes them down. “I am fifty two, live alone, considered some mad freak genius/In reality I am a fucked up poet who will never come to terms with the world….” Right here, Micheline has gotten at the heart of his failures and at the same time you can read between the lines that these failures also make him Jack Micheline and will provide him with a kind of fucked up genius to write the only kind of poetry that he is truly capable of. Chasing Jack Kerouac’s Shadow isn’t really about Jack Kerouac at all or about his shadow. This is Micheline’s search for his own shadow, his deepest and most vulnerable self. And, while Micheline has written a substantial body of fine work, I believe this poem is one of the keys to his entire work. This poem may be many things, but it is certainly the most intimate look at Jack Micheline who was always the penultimate performer. In certain ways, it reminds me of some of Vladimir Mayakovsky’s best work. Poems like A Cloud In Pants and The Backbone Flute. All of this leads me to one observation. Jack Micheline’s work really needs to be collected. Maybe we may never have all of his poetry under one cover, but we need as much of it as we can cram beneath covers. Which means that some publisher out there should give his poetry the serious consideration that it deserves. If Micheline were Russian, his work would already have been collected and he certainly would have become as famous as Vladimir Mayakovsky. Please click on the covers to enlarge the images.